"Read, believe, obey . 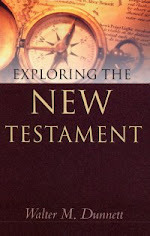 . ."
Devotional guide: Exploring the New Testament by Walter M. Dunnett. Bible: ESV or English Standard Version unless otherwise indicated. It is a great translation, but does not capitalize pronouns for God. I do. If I love Jesus . . .